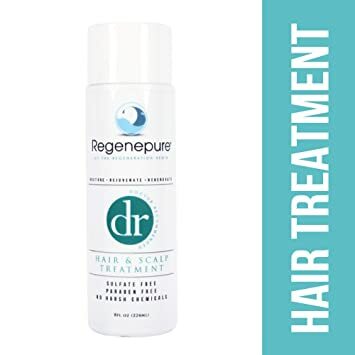 Regenepure DR is Salonceuticals, Inc.’s hair loss shampoo flagship, and it is one of the promising and up and coming shampoos when it comes to fighting against hair loss. It is a specially formulated and crafted shampoo that can work for both women and men. Regenepure DR is also safe to use on keratin treated or colored hair. Salonceuticals, Inc.’s Regenepure DR Hair Loss shampoo is not one of those overpriced hair loss shampoos that you can find on the market. The product also has a fairly solid ingredient list. The DR in Regerepure DR shampoo stands for “Doctor Recommended.” The name fits because it is an innovative shampoo. All the ingredients used in making the Regenepure DR are helpful in effectively preventing hair loss. In choosing a hair loss shampoo, it is important to examine every product thoroughly. Read on to find out if Regenepure DR has all you need for a hair loss treatment. Several scientific studies have authenticated every ingredient used in making Regenepure DR. Take a closer look at what this hair product is made off. Regenepure DD, like most hair loss products, contains aloe vera. It is known to fight against inflammation that is caused by dermatitis, which usually then causes balding. It is a wild fruit that contains healing properties and can block dihydrotestosterone (DHT), which is a major cause of hair loss. Not all hair loss shampoos contain this ingredient. However, it is backed by studies that state it is effective in stimulating hair growth. Ketoconazole is a common ingredient in most hair loss products, being a known hair loss reducer. It also contains anti-inflammatory properties as well as anti-fungal factors. More than that, ketoconazole can also prevent an increase in your DHT levels, a testosterone byproduct that is a primary cause of hair loss in men. It is a thin liquid that comes from emu fat. It was first believed to have a curing effect on cancer, but studies have never been able to attest to that. However, emu oil is beneficial in relieving dandruff and dermatitis. If these factors are the causes of hair loss, Regenepure DR, which contains Emu oil, can help with that. Jojoba oil is a plant-based wax which has been found to have a potent anti-inflammatory factor when applied to the skin. Studies have also shown that jojoba oil can help cure acne when used in clay masks. If the hair loss is caused by a chronic illness, then jojoba oil will be able to help it heal. Regardless of the hair loss product or hair loss prevention shampoo that you use, the realistic evaluation period to notice any changes is about 3 to 6 months. After 12 months, however, optimum results will generally be obtained. However, you will be able to start noticing slight differences in the growth of much thicker hair after a few weeks of using Regenepure DR.
Who Can Use Regenepure DR? Regenepure DR is typically made to work for all individuals, whether men or women. It is best suited for people who are suffering from androgenetic alopecia or pattern baldness. Regenepure DR can also be used as an effective stand-alone treatment for people who are in the early phase of hair loss. Aside from being a helpful product in preventing hair loss, Regenepure DR can also contribute to fighting the symptoms of various scalp skin conditions such as dandruff and dermatitis. Using Regenepure DR can help in improving the volume of your hair immediately and making it look as good as ever thanks to the product’s aloe vera content. Over the years, the makers have altered the formula for Regenepure DR. There is a minority of long-time users that prefer the old formula over the new one. While there are a lot of people that like the effect of the aloe vera content in Regenepure DR shampoo for their hair, there are also others that don’t like it at all. They say that it can cause their hair to be a little limp and flat-looking. The ketoconazole in Regenepure DR can have several side effects like skin itching including headaches and dry skin. Because of the possible side effects of the ketoconazole content in Regenepure DR, it is recommended to ask doctors if they are safe to use for pregnant and nursing women. Current users of Regenepure DR Hair Loss Shampoo love its ingredient list, which is a step up from the basic Nizoral that is commonly used to prevent hair loss. A lot of them also appreciates how the product doesn’t cause their hair to dry out after use. Aside from its practical benefits, the shampoo also smells great, which a lot of users also like about the product. When compared to the typical answer for hair loss, such as Nizoral, Regenepure DR is a lot better especially considering its varied ingredients list. However, the main question would be: does Regenepure DR Hair Loss shampoo actually work? Although there are people who claim that using Regenepure DR shampoo ineffective in battling their hair loss, it is still a relatively new product in the industry. On the other hand, not all hair loss products are made the same. A particular product won’t give the same excellent results to everybody. It is still important to find what is most useful for your case. Jojoba oil is one of my all time favorite products. It helps to keep my hair looking and feeling great. No wonder they use it in this hair loss shampoo! I had heard extraordinary and a lot of things about the DR variation you can feel the cleanser dealing with application and has a flawless, crisp, practically menthol smell and ‘tingly’ feel on the scalp. I regularly utilize it as an overnight ‘leave-in’ yet on ordinary washing days. I leave in for no less than 20-mins post-application.. my hair feels substantially more grounded, with next to no hair-shedding on shampooing since utilizing the item. I am on my third container in two or three months. what’s more, I have a tendency to dependably put on excessively!! So it does last extremely well.